Do you seem to be late for Chama meetings a lot? Has the Chama leader warned you about it? For some people, being on time seems nearly impossible. They are always coming into the Chama meeting in a rush, arriving at least 10 minutes late. If this sounds like you, look at the costs of being late and the payoffs of being on time. It is important to recognize that being late is upsetting to others and stressful for the one who is late. People’s stress level is very high when they’re late. They’re racing, worried, and anxious. They spend the first few minutes apologizing. One of the payoffs of being on time is that you eliminate the stress of the travel time and you eliminate the time spent apologizing. Moreover, the consequences of always running late run deeper than many people realize. You are creating a reputation for yourself, and it is not the best reputation to be establishing. People feel they cannot trust you or rely on you, so it impacts the relationship you have with fellow Chama members. To change this and learn to be punctual, here are some ideas to help you. 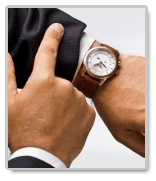 If you’re always late for the Chama meeting by a different amount of time; five minutes sometimes, 15, or even 40 minutes other times, it is likely that the cause is technical. That means you are not good at estimating how long things take. Do a simple exercise: Time yourself one day; moving at a normal pace to see how long it takes you to get ready. You may be surprised at the time it takes, especially if you find you have been trying to squeeze forty minutes worth of dressing into fifteen minutes. Next time you are going for your Chama meeting, you know how much time you need to get ready. Does your leader want you to be seated early before the meeting? If your leader wants you to be in the meeting venue before she arrives, then do so if it’s possible-even if you don’t agree. Do not get angry and blame others if you are not meeting the leader’s expectations. Why cause trouble for yourself? For most people, running late has more to do with anxiety about where they are going. There is a fear factor in which people are anxious about going at all or about getting there too early and having nothing to do. There is a big fear of downtime, an anxiety associated with doing nothing and waiting. You know you’re in this category if you would rather be late to a Chama meeting than spending one minute sitting, waiting for the rest to arrive. To overcome wait time anxiety, plan something interesting to do while you wait. Try to arrive at every Chama meeting 10 or 15 minutes early and use the time for a specific activity, such as reading a novel or magazine, or catching up with friends on the phone. This strategy can help convert dreaded wait time into time that is productive and pleasurable, giving you an incentive to be on time. Leave home on time. She says many people try to avoid downtime by adding in one more thing just before they need to leave. This is a major obstacle to being on time. If you really want to stop this, the minute you think of squeezing in one more thing before you leave, just don’t do it. Stop yourself, grab your bag and walk out the door.